Morse was born on April 27, 1791, in Charlestown, Massachusetts. He attended Yale College (now Yale University), graduated in 1810, and became a clerk at a book publisher in Boston. From an early age he harbored a passionate desire to paint, and his parents finally agreed to finance an art education and sent him to London in 1811. There he became enamored of the English style of painting—bold, brilliant portrayals of romantic legends and historical events. Meanwhile the War of 1812, between the United States and England, created an American hostility toward English tastes, and Morse found upon his return in 1815 that his adopted style was out of favor. He settled in 1825 in New York City and took up portraiture to earn a living, acquiring some distinction as an artist. In 1826 he helped found the National Academy of Design, organized to promote United States painters, and served as its president until 1845. In 1832 Morse became interested in the principles of electromagnetism, recently discovered and developed by Hans Christian Oersted, Joseph Henry, and MICHAEL FARADAY. He formulated the design of an electric telegraph, apparently unaware of similar technological progress simultaneously occurring in Europe. In 1837, with financial and mechanical help from friends, he constructed the first single ­wire electric telegraph, which was able to relay signals more quickly than the multiple ­wire telegraphs used in Europe. But an economic depression discouraged further investments. 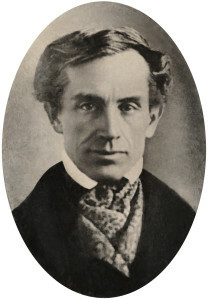 Morse worked for years to persuade Congress to subsidize the building of a telegraph line from Washington, D.C., to Baltimore, Maryland; he finally won a grant to link the two cities in 1843. By 1844 he sent the first message over this line: “What hath God wrought.” After costly legal suits brought by rival inventors, the Supreme Court granted patent rights to Morse in 1854. Perhaps his best­ known contribution came in 1838, when Morse introduced a telegraphic code consisting of varying combinations of dots and dashes. It was soon known across the world as the Morse code and was used for telegraphic and navigational communication. He died on April 2, 1872, in New York City. Morse’s work, although later overshadowed by the introduction of telephone and radio, ushered in the era of mass communication. Like the railroad, the telegraph helped unite the geographically vast United States. By 1852 telegraph lines spread to every town east of the Mississippi, revolutionizing newspapers and commerce. Morse’s electronic telegraph, along with the technological modifications and additions brought by rapid progress in the field of electromagnetism, increased the speed of communication, at first locally and then internationally. By 1865 the first Trans­Atlantic submarine cables had been installed. Telegraphs sent messages more than 100 million times faster than a horse or ship. The resulting improvement in communications made travel and trade more convenient and efficient. Used by Union forces during the American Civil War, telegraphy was credited with assisting their victory by providing immediate information about distant situations. By the early twentieth century, telegraphy had been surpassed by telephone and radio communication, and Morse’s fame had waned. He is remembered mostly for the invention of the Morse code. The longest­ lasting legacy of the code is SOS, the internationally recognized signal for help. The abbreviation SOS is not an acronym for anything, but was chosen because of the three­ unit Morse codes for the letters S and O, which were efficient and easy to memorize. Three dots represent S and three dashes represent O.